Urban sprawl, increased car availability and the concentration of working places and shopping facilities in out-of-town locations have resulted in continuing increases in journey length for all purposes, but particularly for commuting journeys. Access to basic services is becoming more and more dependent on car transport. Improve access to employment, services and leisure activities by environment-friendly transport. Average journey length and time per person, by mode and purpose (work/education, business, shopping, leisure, holidays). 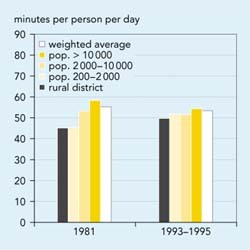 Average journey lengths and times provide simple measures of the ease with which people have access to basic services. They are determined by spatial planning (the distribution of socio-economic activities and home location) together with the availability of public and private transport infrastructure. EU transport policy has in recent years focused on the concept of sustainable mobility rather than accessibility. Reducing the demand for mobility (e.g. by a better integration of transport planning and spatial planning) has attracted less attention. Some countries (and cities) have taken initiatives to improve coordination of regional, urban and transport planning by increasing accessibility while reducing the demand for car transport. This can be done, for example, by mixing urban functions, introducing zoning and parking policies and improving public transport. The Dutch Government has adopted a policy aimed at concentrating employment-intensive land use around public transport routes and interchanges. The target (by 2000) is to keep the ratio of journey-to-work travel times by public transport compared to private car below 1.5 on all main commuter routes. The UK government has a policy of reducing demand for transport through appropriate land-use and development planning. The government encourages local authorities to improve accessibility to help determine the location of new development and the need for improved public transport infrastructure. Commission information-exchange initiatives such as the Car-Free Cities network, the European Local Transport Information Service and the database on Urban Management and Sustainability are contributing to the spread of good practice. Another important framework is the action plan of the ESDP, which was recently adopted (CEC, 1999). This aims to strengthen the link between spatial policy and transport policy (in particular the TEN), and promotes the assessment of the spatial impacts of Community policies and territorial impact assessments. Type A firms are expected to locate in areas very well served by public transport. Type B firms in areas well served by public transport and fairly easily accessible by car. Type C firms in areas where road and motorway access is particularly important. The national government also intends to use fiscal and tax leverage to ensure that firms comply with these guidelines, but many of these mechanisms are not yet in place. The municipal governments, as planning authorities, have more influence on land supply than demand. As a result, only limited enforcement of the national ABC policy has been possible. Although some countries collect information on this indicator, no EU-wide data is yet available. This assessment is therefore based on case studies and a literature search. work travel (mostly commuting, but some trips within work) accounts for 20-30 % of travel; services, civic, educational, and family business accounts for about 25 % (except in the US, where the share was higher); leisure (including culture, sports, outdoors, etc.) make up the rest. the average trip length by car is about 13-15 km for all European countries studied. 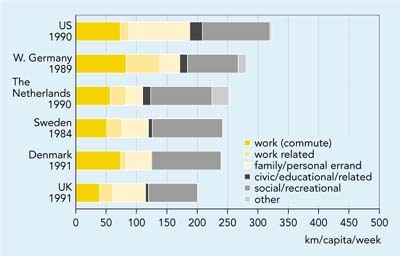 Even though cars are increasingly built for higher speeds and longer trips, they are still used mainly for local transportation (about 80 % of all trips are less than 20 km and 60 % are less than 10 km). Since car trips are about the same length in the US as they are in the Netherlands, the higher US km-per-capita figures arise from more trips per person. In the UK, the length of the average commuting journey increased from 10 km in 1995/1986 to 13 km in 1996/98 %. An increasing number of commuting journeys are made by private car and fewer by public transport. Cars account for around 59 % of all journeys, and for 71 % of commuting trips. The length of the average shopping journey in UK increased from 4.2 km in 1975/76 to 6.2 km in 1996/98. This is a result of the growth and success of out-of-town shopping centres and retail parks. The average education trip increased from 3.2 km in 1975/76 to 4.4 km in 1996/98. The relationship between socio-economic activities and transport volume is illustrated by shopping patterns in Denmark. 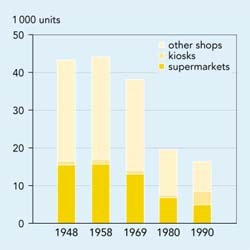 Between 1960 and 1993 the number of shops decreased by 60 %, while shopping-related transport increased by a factor of 3.8. Shopping-related car transport increased even more . by a factor of seven. Thus the concentration of shops into larger units led to increases in transport volumes (Figures 3.5 and 3.6). National travel surveys in the UK, Germany, Switzerland, and the Netherlands show that citizens spend on average about 75 minutes per day travelling, made up of 3 trips of 25 min per person per day (1998 DG Transport fact sheets). In 1996, average time spent commuting to and from work in the various countries ranged from 23 minutes per day in Italy to 46 minutes in the UK. 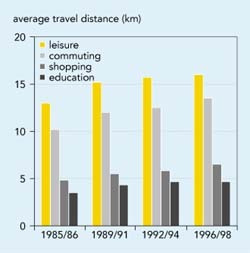 Data from Denmark shows that the time budget for travelling has remained more or less constant over time, although earlier differences between urban and non-urban areas have levelled out. In 1991, 3.2 million people in Belgium commuted to work . an increase of 0.5 million since 1970. This was due, amongst other things, to increasing urban sprawl and more double-income families. The car had become the predominant commuting mode . seven out of ten employees, more than twice the number in 1970, commuted by car, or shared a colleague. s car. 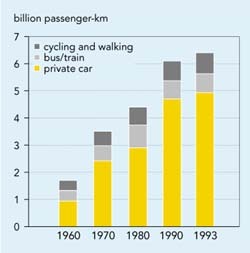 Public transport, cycling and walking trips decreased dramatically, both in absolute and in relative terms. Average car speeds were however lower because of increased congestion, and commuting distances had increased as a result of urban sprawl. In 1981, commuters took on average 24 minutes to reach their place of employment, but in 1991 they took 32 minutes. In 1991 the average commuting distance was 17.6 km, but 50 % of journeys were less than 10 km. Car-pooling had increased (from 5.9 to 8.9 %), but had not yet achieved a significant breakthrough. More in-depth studies of the concept of, and criteria for, . sustainable accessibility. are needed. This should allow a better accessibility indicator to be defined which would say more about the links between factors such as land use and car ownership. In future, the indicator will need to be differentiated geographically, e.g. distinguishing urban/rural accessibility problems and showing regional differences. The indicator should enable analysis of changes over time in average journey lengths, by purpose and mode, in order to assess changes in access to basic services and the reasons behind increases in transport demand. In several Member States regular travel surveys are carried out to collect information about trip purpose, mode and length. Such data should be harmonised and combined at the EU level. Standard definitions of journey purposes are needed, e.g. distinguishing between commuting (including education), shopping and leisure. Data on concentration of shops and working places should also be collected. For references, please go to https://www.eea.europa.eu/publications/ENVISSUENo12/page017.html or scan the QR code.